If you live in Los Angeles and you listen to KCRW, chances are you’ve heard of Evan Kleinman (hint: if you don’t live in Los Angeles you can stream her show, Good Food, live on the internet every Saturday at 11 am Pacific). Kleinman is a chef/restaurateur turned part-time commentator who brings listeners news from the farmers’ market coupled with guests representing different aspects of the food industry. Most Saturdays I can be found driving around in my car, running errands and making my weekly farmers’ market trip with Evan Kleinman accompanying me on the radio. I can’t tell you the number of times something on the show has spurred me into action, changed my list of must-gets at the market or changed my course entirely to head straight to the bookstore to buy a new cookbook after hearing the author on Good Food. This happened just a few weeks ago when Karen Page and Andrew Dornenburg were on the show discussing their new book, The Flavor Bible. If you like to play with flavors and create your own recipes, this is a must-have. It examines ingredients, one by one, and lists their flavor profiles along with the other ingredients that best compliment it in a recipe. In addition to listening to the show, I have recently started following the Good Food Blog on KCRW’s website. It’s a great place to get news on the happenings at Kleinman’s restaurant, Angeli Caffe, to follow up on what I may have missed on recent shows, and from time to time, to snag a great recipe from Kleinman. 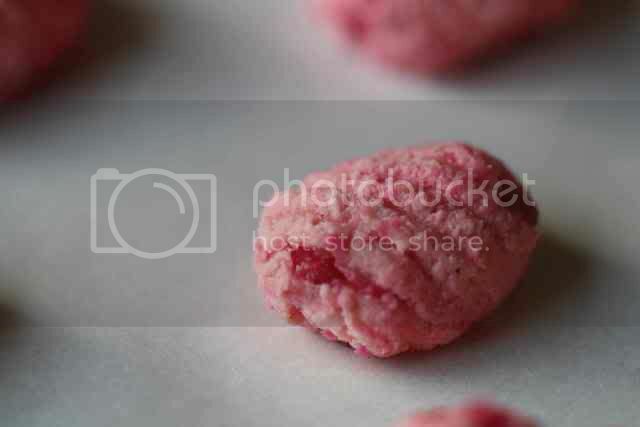 This past week, the recipe for Angeli Caffe’s Beet Gnocchetti was included. Beets are an extremely effective food dye and I could just imagine the bright pink color that they would impart to a gnocchi dough. I quickly added beets to my farmers’ market list and a pound of fresh ricotta to my weekly Surfa’s cheese stop. This recipe was really fun and relatively simple to make. I should have followed my gut when the beets just did not look like there were enough. Next time, I’m either going to use more or, rather than grating on the large wholes of a box grater as Kleinman suggests, I’m going to process them in a food processor so I get more of a beet pulp that will impart color more effectively and more evenly. I still love the speckled pink color that the coarsely grated beets provided, but it just wasn’t what I had originally envisioned. My gnocchetti ended up closer to the size of regular gnocchi. They were easier to work with that way and afforded me the opportunity to practice rolling them on my gnocchi board. This recipe made enough dough for at least four servings if not more. I used about a fourth of it to make my dinner and then froze the rest for future use. I have no idea how the dough will hold up to freezing, but I thought it better to try than to waste all those gnocchi. Wrap the beets in tin foil and bake in a 450* oven until tender, about 45 minutes. Let cool. Grate beets on the large holes of a box grater. Or, if you’d like to experiment, try pureeing them in a food processor. 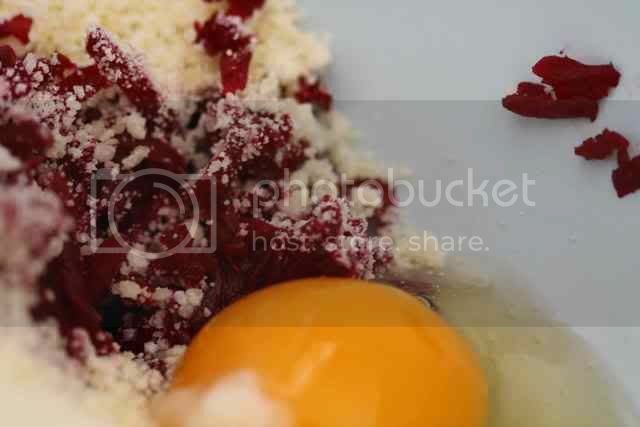 Place the beets in a bowl and add the egg, parmesan, drained ricotta and a sprinkling of salt and pepper. Mix well. Add the flour and mix until just incorporated. Let the mixture set for at least two hours in the refrigerator. When ready to form the gnocchi (or gnocchetti if you prefer to do tiny versions as Kleinman suggests), line a baking sheet with parchment paper and place about a 1/2 cup of flour in a bowl for dredging. 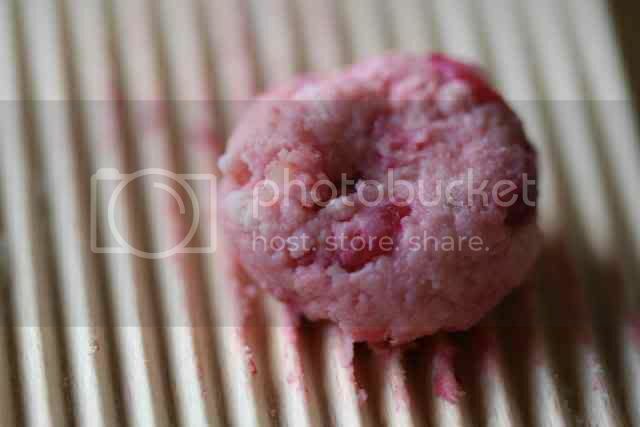 Take a gumball sized piece of dough and roll it in your hands to create a ball. If you are using a gnocchi board, place the ball on the board and use your thumb to roll the ball slightly upward, just enough to create lines on one side of the gnocchi and an indent from your thumb on the other side. Pull the gnocchi off the board and dredge lightly in flour. Place the gnocchi on your baking sheet and repeat until all the dough is used up (recipe continued below). Place the butter in a large sauté pan and add the sage leaves. Melt the butter and steep the leaves until they’re crispy and the butter is starting to brown. Keep the pan with the butter warm while you bring a pot of water to a simmer. Slip the gnocchi into the pot. Once the gnocchi have floated to the surface, allow them to cook for one to two minutes more. Kleinman suggests straining them with a slotted spoon and transferring them to a platter to be topped with the sage brown butter sauce. I opted to strain the gnocchi and transfer them directly to the warm sauté pan where I tossed them with the brown butter sauce and then served them. 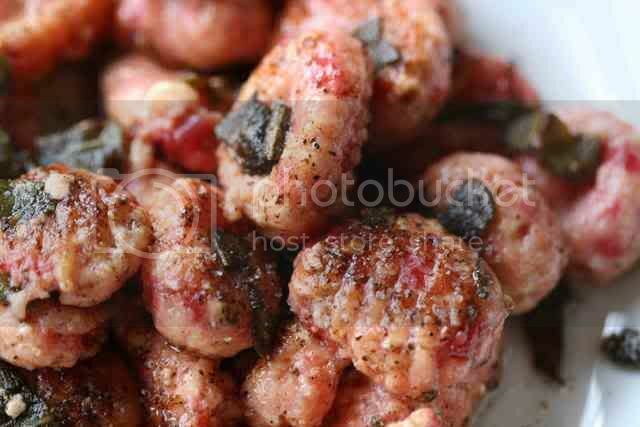 This created a little bit of browning on the gnocchi that may not have looked as pretty, but certainly tasted amazing. Choose whichever option you like and make sure you have some crusty bread to sop up any leftover brown butter sauce. Oh goodie, I have a bunch of beets that I have no idea what to do with. I'll have to try this recipe! Does 1 medium beet reflect the original recipe, or is that after you added more? As in would you suggest I be more generous than that with the beets? These look awesome! I listen to Evan/Good Foods via the internet every week! I have even been enjoying the older episodes- they make my days at work fly by! These look incredible, I've only done gnocchi with potato. I love that you crisped them all up, the texture contrast is great. I am loving these! The color is so fun and I bet they are so tasty! The colour tells the story here. Amazing! really, your photography is top-notch. perhaps a lovely book in the works?? I love using beets as pink food (well within reason) just makes me really happy. I inherited a gnocchi board from my grandma that I've never had the opportunity to use so I'm bookmarking your recipe now and will hopefully get to try it out soon. i clicked through hoping there was something new today! viola and yay! when i tried to make sage/butter sauce, the sage was really bitter. is it supposed to be like that? did i need to cook it longer? help! oh, and i LOVE evan kleiman, too. thanks for the reference! I love Angeli Caffe -- their vegetarian lasagna is one of my favorite pasta dishes in the city. So good! Oh wow - those are gorgeous and so creative! Love it! I love beets, but hate how they stain everything they come in contact with. These would be so perfect for like a bridal shower or something girly. So pretty! I can't wait to make these...isn't there something strangely therapeutic about shaping gnocchi on a tiny ridged piece of wood? the colour is amazing - they look great!